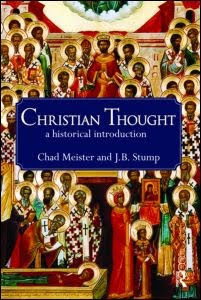 We recently interviewed Chad Meister and James Stump about their recently released book, Christian Thought: A Historical Introduction (Routledge, 2010). Chad and Jim are the book review editors for Philosophia Christi (along with Tim Erdel!). How did this book come about? Why did you guys write it? Chad: Way back in 2006, I was asked to review a proposal for a book on historical theology for Routledge. The review I sent them wasn’t very positive, so they asked for some revisions. In the end, the author ended up declining the project altogether. Routledge then asked if I had any interest in writing such a book. I did have an interest, but also several other projects in the works. Jim and I had been talking about collaborating on a project at some point, so I asked him if he had any interest in working on this book together. Jim: I was going through a transition at the time, getting out of academic administration and back into a faculty role. As part of that, I was thinking about various scholarly projects I might work on. I’ve always been interested in intellectual history, broadly speaking. Obviously the history of Christian thought is a major component of that. This seemed like a good project to undertake in order to get back into the scholarly field and to be immersed in the rich tradition of Christian thought. What was it like to write this book as philosophers who have an appreciation for the historical dimension and development of ideas? How does your approach differ from others? Undoubtedly we have some disciplinary bias, but we feel that as philosophers we have the kind of training that helps to get at the inner logic of ideas. We’re not just giving loads of historical facts, the way such books are sometimes written, but attempting to understand and unpack the flow of thought in Christian history. In this sense we’ve tried to write a story that pulls you along from one episode to the next. Almost all historical theologies begin in the second century; we thought it was important to start before the time of Christ to show how the major currents of thought provided the context for the origin of Christian thinking. Another dimension of our book that is fairly unique is the inclusion of many of the voices that have been lost or neglected. It took some digging to uncover the significant contributions of women and cultural groups outside of the mainstream, but we found their voices to be important for the development of many of the central ideas of Christian thought. We couldn’t in good conscience perpetuate the marginalization of these often suppressed contributions. Then, to aid in pedagogical effectiveness, we added plenty of charts, timelines, maps, pictures, icons, and other boxes of substantial quotations from primary sources. So, rather than page after page filled with text, there is an engaging and aesthetically inviting presentation of the material. Sometimes there seems to be a tendency in analytic philosophy to approach ideas, even ideas that have a historical pedigree to them, with an ahistorical attitude. Can you address that attitude in light of your own work on this book? Yes, that’s very true. Continentalists have generally done a better job at recognizing the value of historical and biographical work for understanding ideas. While we do appreciate the aims of clarity and concision provided by the analytic approach to philosophy and theology, for a work like this we needed to contextualize the ideas. After all, it is a history of Christian thought. But beyond the obvious historical dimension, there are fairly big differences in the approaches that authors have taken. Something like Jaroslav Pelikan’s massive five-volume work on the history of dogma gives almost no historical or biographical context; it is just straight development of ideas. And then there are others who end up deconstructing the ideas until all that is left is a story about the people and their lives, as though the ideas are reducible to these. We tried to find the ideal via media. It really became apparent to us that the ideas we are discussing were highly influenced or conditioned by their times and even locations. This doesn’t negate their universal nature, but it shows that they are not disembodied abstractions. There were real people who wrestled with their experiences and the truths that were passed down to them through the ages. This couldn’t help but take on a particular cultural shape. So we included enough of that to give a feel for the cultural embeddedness of Christian thought. What did this “historical introduction” do for you, even as it concerns how you view your own work in philosophy and theology? Jim: The first thing I’d mention in this regard is that the project imposed some discipline on my writing schedule. There was a stretch of many months in which most evenings were spent working through these chapters. Inspiration comes only in fits and starts, but most of the work on a project like this is just that—work. Whether or not you have any wonderful ideas or insights that day, there is work to do in tracking down sources, reading through documents, and putting words on the page. I think that process helped to shape me as a writer and scholar. Chad: Then of course the content can’t help but shape you as well. As we were digging back into original source material from many of the great women and men of Christian history—such intellectual and spiritual giants as St. Paul and St. Anthony, Augustine and Aquinas and Luther, Julian of Norwich and Teresa of Ávila, John Wesley and Karl Barth—you realize that you are in the midst of a beautiful, powerful, life-changing tradition. We couldn’t read through these great works for scholarly purposes alone. We read them and were inspired by them; we read them and were in many ways transformed by them. Jim: We should probably mention too that this project had an impact on us personally as friends. We were very good friends before we started this project. We work in the same department, we have offices right next to each other, and we do lots of things together. But adding a large undertaking like this to the mix can’t help but affect things. We had a common focus for our intellectual energy and I think that deepened our friendship. And of course there were disagreements along the way that had to be maneuvered. There is a lot of give and take involved in working together on a major undertaking such as this. Individually, we would have probably written very different books. But I think we’d both agree that our final product is better than it would have been for either of us on our own. Chad: We also laughed a lot through this project. I remember several occasions of working together through drafts of chapters, and we’d start laughing so hard at some trivial thing (probably due to mental exhaustion after spending so much time on the project!) that we would have to stop for a while to recover. It was a lot of work, but it was also a lot of fun. Can you give us a snapshot of the major divisions of the book? Of course any divisions like this are somewhat artificial, but there is value to demarcating major periods in this way. Then, of course, there are chapters in each part which treat topics or people more specifically. But we tried to write the book with a narrative or even story-like feel to it. We hope that when you get to the end of one chapter, you’re drawn into the next by the flow of the narrative and the inner logic of the ideas. There are certain themes that resurface throughout the narrative. Of course we emphasized what are commonly understood to be the major events and key figures in the history of Christian thought. But beyond this, as we were writing we both had sticky notes in plain view of our computers that reminded us to pay special attention to three themes in the material we covered: 1) What was the relevant historical context in terms of wider intellectual movements and political/social events of the time? 2) What are the significant voices from the time period that have been omitted or suppressed? 3) How did the practice of Christianity influence the development of ideas? On this last point, it is common to describe how theory influences practice. But this isn’t just a one-way street. We wanted to show that Christian thought does not take place in an ivory tower, but is an outgrowth of the experiences of worshipping communities. How would you like to see this book used? We wrote the book with the intention that it could be used in the undergraduate or seminary classroom as a primary text for courses in historical theology, Christian thought, intellectual history, church history, and even more general courses surveying Christianity. It could also be used as supplemental material for a host of other courses for which the history of Christian thought is relevant. Beyond this, however, we also had in mind the general reader who is interested in getting a solid introduction to the history of Christian thought. In fact, the publisher used a focus group of laypeople from a church to read through the manuscript and provide feedback from the non-specialist. We’ve taught through the material to church groups, and it has been received very well in that setting. It’s beneficial for all Christians to have a better sense of where our ideas have come from, so we’ve tried to make this book accessible without sacrificing the depth of the content. Chad Meister is a Professor of Philosophy at Bethel College, and James Stump is the Director of the Philosophy Program, and Professor of Philosophy at Bethel College. You can preview their book by going here.